I haven’t been to a Spurs game in over 30 years. 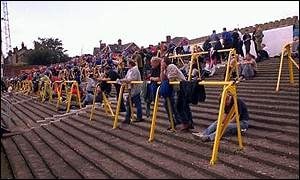 Back then most people actually stood up on what were known as the terraces. (See photo below.) The Hillsborough disaster changed that. Before our trip, Angie was studiously checking to see when the Tottenham Hotspur schedule would come out. Then brother Peter coincidentally sent us an email about a pre-season friendly about which we had also received info, and this was for a game that was considerably cheaper than a regular season game, not that there are any home games that we could go to while we are here. Wanna go? I asked him. Before I knew it tickets were purchased for the East Stand, a bit above where we used to stand in the old days, on the Shelf. Peter picked us up and took us down to White Hart Lane, where huge crowds were already packing the streets around the stadium. We stopped off (as one does) for some excellent Chinese food at a place recommended by nephew Michael (a season ticket holder, so he knows whereof he speaks). It was an interesting setup: a warming table by the door, like the all-you-can-eat places in the US, but you picked out the dishes you wanted and a server piled them all into a plastic container and took your money. Then you stand on the street outside and eat it. Very tasty. We tried to go into the Spurs shop but it was so full that the checkout line was the entire store. This game was a sellout, even though it was just a pre-season friendly. Hence the store was jam packed. Enough with the crowds already. So, the game. Well, Spurs looked like the better team throughout, nearly everyone on the roster played, and WE WON!!!!! My favorite parts were, well, the goals: a great piece of teamwork that Adebayour finished up, followed by a wonderful display from three different players to put Spurs up 2-0. Andros Townsend had a cracker of a shot that was subject to a spectacular save by the Schalke keeper, but Soldado was in the right place and had the great reflexes to put the ball into the net. and witnessed a win. I just wish the team jerseys weren’t so spendy. One thing I have to mention. It’s a really good thing they are building a new stadium, since the section we were in had a Ladies that had only two stalls, but a LOT more women go to games now than in years so that needs to be fixed. But we won’t expect cup holders and leg room in the seats.